Tired of wondering how your Salesforce features and applications were implemented in your org? Save time, increase productivity, and cultivate a greater collaboration with a central repository that tracks how and why your applications were built! Capture and document Capabilities directly in Salesforce. Document all the personas of a Capability to make sure you are putting your Customer first. Collect Features from ideas to actual implementation. Map out each Use Case to ensure no detail is forgotten. Quickly get a 360 degree view of your Organization by having the ability to see and search all of your Salesforce Metadata as Components. Here at Catalio it's our desire to help all of our customers enjoy utilizing their Salesforce Organization to the fullest capability! In doing so, it becomes quite difficult to truly remember how everything works or how it's all connected. This is why we developed Catalio, a journey that's taken us over a year to build and deliver! When looking around the Salesforce ecosystem, it's easy to see everyone documents their Salesforce Org differently. Some use Word and store them in a central location, others use fancy tools like Confluence to make it easier to collaborate, but they all take a ton of effort to keep in sync! Salesforce is known for how quickly you can make changes or build end to end Capabilities in days or even hours, but how do you make sure your documentation and governance stay relevant and accurate! The first step is to use the same software that built all these Capabilities as your documentation tool! 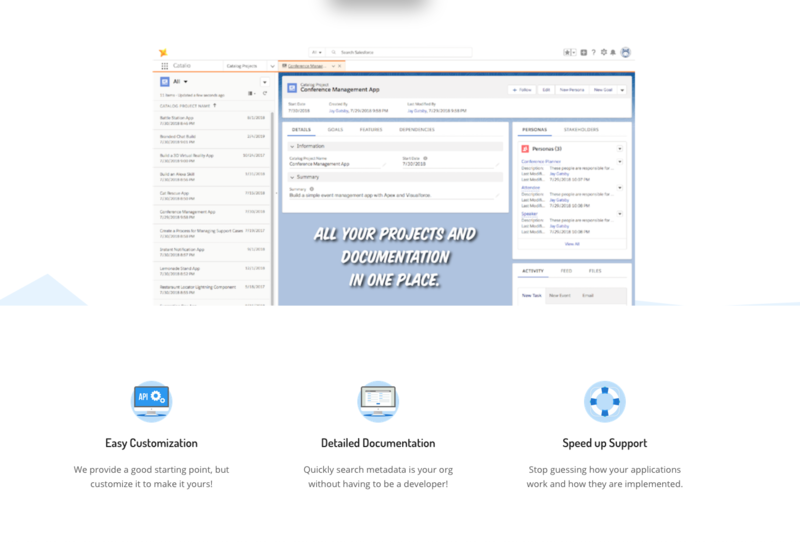 We built Catalio in a way that you can install it in your very own Salesforce Org. This has some advantages, like knowing your Salesforce Org. We can dump all of your Salesforce Metadata into a custom object so that you can explore, search, and understand how the landscape of your Org really is, since it's all in one place. Stop jumping to other tools, instead use the same software you use everyday to document your Capabilities, and take what we have built and build on top of it. This is possible because it's installed in your Salesforce Org, and you already know how to build things in Salesforce, so build away! Once you've started documenting how your Capabilities are built, and it's all in one place, you can start helping yourself when it comes to governance! Now if we are honest, we don't help you much when it comes to governance when it comes to our first release, but boy do we have some exciting plans when it comes to this area! Imagine a day where Catalio could help you consolidate Process Builders, tell you about unused Code, how to consolidate Profiles or even tell you that two objects look to be similiar and you might want to think about consolidating them! Imagine if we could make a game plan to help you do these! Before we get ahead of ourselves though, we need to know how you are using your Salesforce Components. Once we have that, and again that helps you and your team when it comes to building future Capabilities, we can then do some cool things to help you when it comes to Technical Debt, because who honestly loves trying to maintain all of these things manually? All of this sounds hopefully sounds amazing and great to you as it does to us, but how do you get your hands on Catalio? You can test drive our app, or you can even install it in your very own Salesforce Org and try it for 30 days! We've allowed a 30 day free trial so you can try our app without even asking for a credit card! Here's the link: Catalio! If you every have any questions, we are always around and would love to help you on your journey.